Sometimes I would get the feeling (particularly when talking to some of my students) that the mixing chamber of an abrasive waterjet (AWJ) cutting system, together with the feeds in and the focusing nozzle outlet, were considered to be some magical black box out of which a perfect cutting stream issues to cut the desired material. Figure 1. Comparative performance between 12 nominally similar abrasive waterjet cutting nozzles in cutting through steel at a standard speed, pump pressure, and abrasive concentration. I described the actual test in another post, and it is clear from these averaged results that there is a wide difference in performance between the nominally similar tools. While I don’t think there is a lot of interest in going through the details of different designs it might be helpful to explain some of the factors that play a part in producing jets of greater or lesser performance. To return, first, to the basic construction of the mixing chamber and focusing tube assembly (AWJ nozzle), one starts by recognizing that the major cutting performance will be achieved by the particles which remove material when they hit the target. The energy that they have, however, comes from the water that is fed into the AWJ nozzle through a small jeweled orifice, or waterjet nozzle, at the top of the mixing chamber. That waterjet stream is small and initially highly focused and fast moving. As it moves through the mixing chamber, as I have described in other posts, the outer edges of the jet slow down, and gradually the jet fans out and breaks up into fragments. There is no benefit in trying to inject the abrasive into the jet at the beginning of this passage, since, at that point, the outer layers of the jet have enough energy to knock away the particles before they can enter the fastest moving segment in the core. 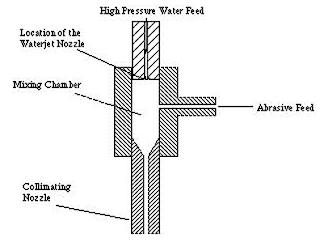 Rather it is better to inject the abrasive further down the chamber, so that the jet will have begun to break down into slugs, and the abrasive can be positioned so that it is impacted by a sequence of the individual slugs and accelerated to the desired velocity. There is an additional benefit to moving the abrasive feed line a little further down the chamber. When the jet stream is rapidly switched on and off, when for example, piercing a series of small holes in a part, then the driving pressure pushing water out of the waterjet orifice switches off and on. When it switches off there is a short period where the differential pressure will draw fluid from the chamber back through the waterjet nozzle. If there are small particles of abrasive in the vicinity (and with some designs there are) then these can be drawn back through the upper orifice, and then pushed back down by the succeeding water flow in the next pulse. 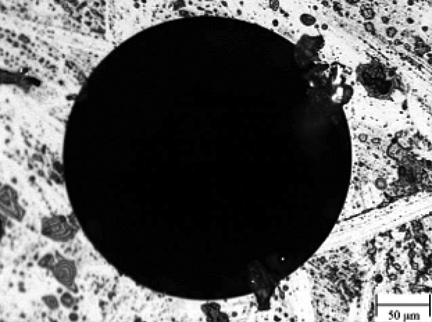 This can rapidly erode softer jeweled orifices, so that they round or chip, not always evenly, and degrade the resulting waterjet as it flows into the chamber. This disruption can move the jet from being in the center of the chamber, and cause poor abrasive pick-up or accelerate wear of the chamber walls, and in the focusing tube. All of these degrade performance. (The solution, if you can achieve it, is to use a diamond upper orifice, since this is largely non-responsive to the passage of the abrasive back and forth, and retains its shape and the jet performance it was designed to produce much longer – providing a cost benefit to the change). 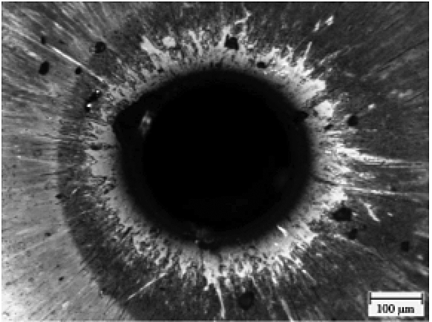 Fig 5. Lack of wear on a diamond insert nozzle after being in use for several hundred hours. With the abrasive inlet channel and jet passage designed to get the abrasive into the jet where the water jet is broken up, yet still moving at high speed, there needs to be a sufficient distance for an optimal energy transfer to occur. 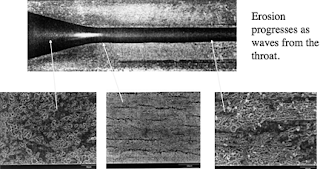 Beyond that point, with the particle and the abrasive (which will have partially been broken in the contact between the jet and the particle, between particles striking one another, and between contact between the particle and the walls of the AWJ nozzle) the cutting jet has to be refocused into the narrow cutting stream that is required to give the finished cut surface desired. 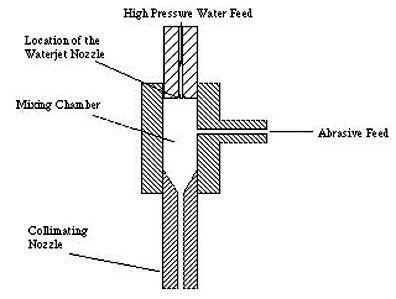 The refocusing of the mixed jet (air, water and abrasive) is achieved with a focusing tube, which is made up of a conic section which brings the jet back together, and then a straight section which allows further energy transfer between the three component parts of the jet, before the jet issues from the orifice aimed at the target. The passage of the particle down this tube is not always straight. Wear typically begins at the tip of the conic section as it feeds into the tube. The wear within the tube will often take up a pattern, as any irregularity in the flow causes it to bounce from one wall of the tube to the other creating a wear pattern along the walls that has a wave-like structure. When this wear reaches the mouth of the focusing tube, then the downstream orifice is eroded out of a circular shape, and the jet that comes out no longer will cut cleanly, or to as great a depth. 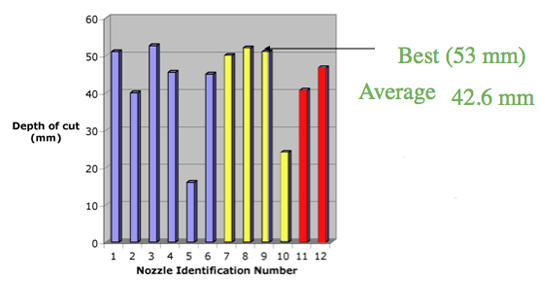 At that point the nozzle is worn out and should be replaced. The point at which that replacement occurs varies depending on the quality of the cut that is required. Obviously when the cut being made is at a precision of a thousandth of an inch over a cut depth of half-an-inch (as with some aircraft parts) the replacement point is reached a little earlier than if the cuts being made are a rough cut merely, for example, to separate two parts one from another, and provide a rough shape to the piece. I’ll continue this topic in the next segment of this section.